I have leftover low fat cream cheese from when I made cream cheese brownies a little while ago with Yang and Dough Girl. And I had some frozen berries that I could use. And I was really bored and hungry for dessert. So I whipped up a batch of these raspberry custard cups. I love custard, but I hate how dish and time intensive making custard is. I always feel like I overcook it, at which point I need to strain the custard to get out the scrambled egg bits. Ugh. I measured out the first stage of ingredients and went into the fridge… to realize that we only had chocolate milk. I contemplated using it for about thirty seconds, then yelled to Dad that I was going to Trader Joe’s (my happy place, besides Barnes and Nobles) for milk. I had 20 minutes, so I ran to the van and sped out. I almost hit a biker, but didn’t. Thank goodness. I also got some whole grain cereal there, because you never know when the munchies will hit. I used 2% milk. I have to admit, I didn’t stir constantly, though I did end up paying for it a bit. The custard on the very bottom edges scrambled, though I was able to keep that in the saucepan. It started thickening way before the 5 minute mark; more like when the custard started boiling. The cream cheese wasn’t quite room temperature, but the heat of the custard made the coldness okay. I made sure to whisk each piece of cream cheese in until it was fully incorporated before adding the next one. The cool cheese helped chill the custard, and I didn’t have to refrigerate it for that long (maybe 30 minutes?). I modified the recipe slightly. Instead of doing custard on the bottom and fruit on top, I reversed it. I don’t really want hot bruleed fruit, and want to veer more towards a creme brulee sort of top. I spooned defrosted berries into seven custard cups. I then spooned the custard on top, rather than poured, since it was so thick. I smoothed the surface with the back of a spoon before sprinkling on turbinado sugar. I used that instead of brown, since it’s easier to sprinkle. I forgot to broil the custards sans sugar first, but I figured it’d be fine. The custard already tasted so good on its own that I wasn’t afraid. I broiled it for 2 minutes, just until the sugar was molten and bubbly. I should have let it go longer so that it could become crisp and shattering like a creme brulee crust, but I was afraid of burning them. The final raspberry custard cups were delicious. The custard was creamy and smooth, with the slight tang of the cream cheese. It was a little too sweet, but cutting it down to 1/4 cup would help; I’m slightly apprehensive to suggest it, however, as I’m not sure how it would affect the texture. A more surefire way to combat the sweetness is to use tart berries. Raspberries or blackberries would work well, but I imagine strawberries would be too sweet. Broiling isn’t necessary in my opinion. 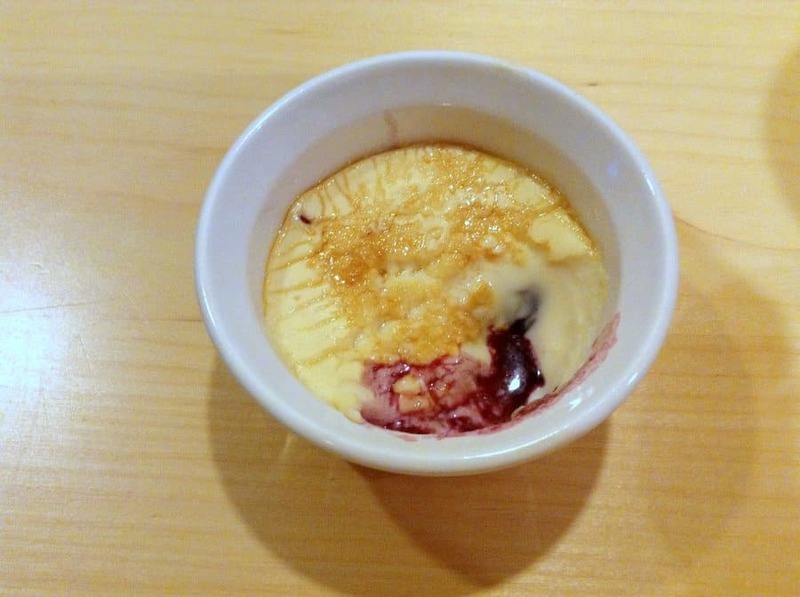 True, I didn’t get the full effect, as my brulee wasn’t quite right, but I still think a cupful of custard with a bunch of really juicy, fresh berries would be just as lovely. Cheesecake and creme brulee, rolled into one. In a medium saucepan, combine the sugar, egg, flour and cornstarch. Add the milk and vanilla. Whisk well. Bring to a boil over medium heat, whisking constantly. Cook and stir for 5 to 7 minutes, or until it thickens. Add the cream cheese. Stir for 2 minutes, or until the cheese melts. Cover and refrigerate until cold. Divide the berries between 6 custard cups set on a baking sheet. Pour in the custard. Sprinkle with raw sugar. Broil briefly. Watch them carefully and pull them out when the sugar is bubbly and brown but not burnt. Alternatively, you can just serve the custard in cups with berries on top. No broiling necessary.